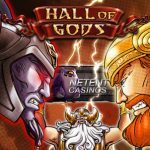 With almost €3 million in the jackpot, the Hall of Gods™ online slot is the most lucrative NetEnt slot at this point. The Hall of Gods™ Jackpot is the 4th highest online casino jackpot right now and with 18 weeks since the last win, we’re getting closer to the average time this jackpot needs to find the next winner! What do we know about the Hall of Gods™ Jackpot? Well, it looks like the Hall of Gods™ online slot’s popularity is decreasing with the jackpot filling up less fast. Is this a bad thing? Not necessarily, because this results in less competition for you. However, with only 3 online casino jackpots being higher than the Hall of Gods™ Jackpot, this NetEnt slot will attract more players. It’s because of this that the jackpot will grow faster along the way and before we know it hits the 3 million, growing higher and higher. These numbers also tells us that the average time this Mega Jackpot takes to find a winner is 20 weeks. And as 18 weeks have passed since the last Hall of Gods™ Jackpot win, this jackpot gets hotter and hotter every single day! The average jackpot won, based on the last five wins, amounts €5.6 million but I don’t see this jackpot climbing up as fast as before, so I’m pretty sure at 20 weeks, the Hall of Gods™ Jackpot won’t match the average jackpot win. Well, if it ends up being €4 million, no winner will complain. I’m sure of that! With the last 5 jackpots being won between 17 and 22 weeks after the last jackpot win, the Hall of Gods™ online slot is super hot right now! Every day, this jackpot becomes hotter and yes, it can take even more weeks to be hit, but if it falls tomorrow, you’ll feel as if you missed out on a great opportunity! That’s what gambling is all about! My advice? Take it easy, stay safe and bet a few bucks here and there. Don’t go wild straight away, but start playing consistently. Go for lower bets for a longer time to keep your sessions as long as possible. Make sure you don’t waste money and only spend the bucks you have available to spend on video slots. Like that, playing for a jackpot remains fun and if you miss out on winning the Hall of Gods™ Jackpot now, you can try to play for another one. 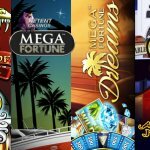 Besides, there are two more progressive jackpots linked to the Hall of Gods™ video slot, so it’s not all about the Mega Jackpot of almost €3 million. The Hall of Gods™ online slot is available at around 125 NetEnt Casinos and therefore, millions of players have access to this jackpot game. However, not all players are interested in jackpot slots, but if you do, make sure you take the next weeks to haunt this attractive multi-million jackpot! With the whole Nordic gods gang there, Thor, Loki, Odin, and Idun, the chance that the gods are on your side is big! When these Norse Gods are not busy wielding hammers and throwing lighting, they might have some time to help you become wealthier than before! If it’s the €3 million Mega Jackpot you have set your mind on, playing the Hall of Gods™ online slot is the way to go! 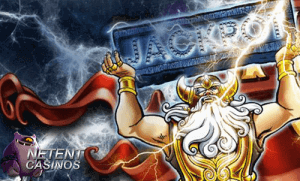 You’ll meet up with the most powerful Norse gods, the Midgard Serpent, and Odin’s Ravens while enjoying all the good things this jackpot game has to offer! Of course, the main attraction in the Hall of Gods™ online slot is the Mega Jackpot – now offering almost €3 million, but that’s not all there’s to enjoy! You’ll catch up with the Midgard Serpent in the role of Expanding Wild, while Odin’s Ravens bring quality to the Scatter. The Norse Gods will be responsible for the largest symbol wins, but your final destination will be the bonus round in which you’ll find the three Mega Jackpot symbols. Before you get there, though, you might need a lot of patience! It’s pretty unknown that a player hit a multi-million jackpot on a first spin. If only it was that easy, right? But it isn’t, so make sure you stretch your playing session by playing with lower bets. Not too low, though, as most multi-million jackpot are won with bets over €1. However, I rather advise players to play 100 spins with a €1 bet rather than 4 spins with €25. This is just an example. Of course, you can pick any bet and even with a minimum bet of €0.20 you have a chance to win a Hall of Gods™ Jackpot, but with a higher dose of luck involved. While playing, you’re aiming for three bonus symbols in order to trigger the Hall of Gods™ bonus game. All symbols will become shields with Thor’s Hammer available to break the shields in order to match either 3 coin wins or 3 of the same jackpot symbols. If 3 coin wins match, you’ll win the amount shown. If 3 jackpot symbols match, you’ll be awarded either the Mini, Midi or Mega Jackpot.